"We have special memories of the Feast of Wine and Music tour of 2006, when in Ljubljana, the brilliant young French pianist, Emmanuel Despax, gave two superb performances, including the Schumann Symphonic Etudes Op 13 and some inspiring and exquisite Mozart. Also here, Roma played the Mozart Piano Quartet in g minor, K 478, with the Ljubljana String Trio. This tour, escorted by well known wine identity, Christopher Barnes AM, of the Hunter Valley, found us travelling from Strasbourg along the Route des Vins and visiting several famous wineries and vineyards in the Alsace and Burgundy as well as staying in the luxurious Burgundian Chateau de Gilly. A memorable tour indeed!" Join Lingua Musica in a spectactular journey of classical musical, breathtaking scenery, art, history and culture in the company of like-minded friends. Commencing in Zurich, most beautifully located on the River Limmart and surrounded by wooded hills, our touring days will be filled with spectacular music performances, guided tours, visits to major art galleries and conservatories and informative talks. Highlights of our tour this year include the Lucerne Festival, one of the most prestigious classical and contemporary music events in Europe. Attracting more than 110,000 visitors, it’s a favourite for Lingua Musica because of high quality performances in magnificent settings. 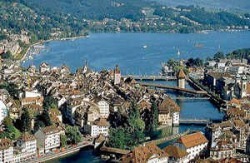 The 2010 Lucerne Festival offers a variety of performances, including the San Francisco Symphony (conductor Michael Tilson Thomas), the Bolshoi Theatre and Chorus, and the Vienna Philharmonic (conductor Nikolaus Harnoncourt). The tour travels on to Berlin for concerts, opera, great galleries and a day trip to beautiful Potsdam. We then join the bicentennial celebrations of Robert Schumann in the wonderful city of Leipzig, important for its connections with J.S Bach, Robert and Clara Schumann, Felix Mendelssohn, Johannes Brahms, Franz Liszt and great literary connections with Goethe, Schiller et al, where we also include a full-day excursion from Leipzig to Weimar, including lunch in Goethe’s favourite inn. The tour ends in Berlin, with optional extras to Vienna and Ljubljana for more opera and performances. - This tour is fully accompanied. Note: This file is in pdf format, requiring Adobe Reader. Please email us if you have any difficulties with this, or call us on (61) 02 9327 5733. Note: This file is in pdf format, requiring Adobe Reader. Please email us if you have any difficulties with this or call us on (61) 02 9327 5733.